Local landowners spend years planting deer habitat. 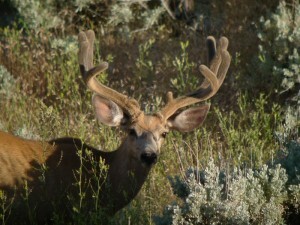 Restoring lost habitat is a long process, as ranchers/deer enthusiasts in my area in Box Elder County have discovered! John and Charlie Young, along with nephews Dave and Tim Freiss, own around 17,000 acres on Promontory Point. Their property has supported the family livestock business for several generations and has endured several large wildfires in recent years. These fires destroyed valuable grazing plants and left almost-worthless cheatgrass in their wake. This was once a sagebrush flat. 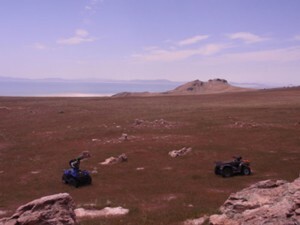 Dave is planning a 2011 seeding overlooking the Great Salt Lake. With lots of hard work and collaboration with various government agencies, they have planted over 1,200 acres that now feed livestock and wildlife. This is just the beginning of what has been a fairly long-term project. Historically, this area provided winter range for more than 2,000 neighboring deer. The deer would migrate from as far as 30 miles to the north just to eat their sagebrush. The area now feeds fewer deer and domestic sheep. Thousands and thousands of acres of sagebrush are gone. The 2001 wildfire alone burned about 80,000 acres of the 110,000-acre peninsula. Stop or limit the fire cycle. Add fencing to control livestock use (help keep them off of new plantings). Put in numerous water troughs for better livestock and wildlife distribution. Re-plant wisely, using as many fire-tolerant plants as possible. To say that Dave and Tim have a passion for mule deer is an understatement. Just working on the fire-prevention measures required them to build around 16 miles of firebreaks. This buck is enjoying an area that Dave seeded. The family also picked up shrub seedlings from the DWR and experimented with planting locations to see what would grow and where. Fall after fall, they worked on planting small seedlings in order to figure out what could be successful. There were many failures. They grew lots of rocks and broke plenty of equipment. It took 13 years to get to the major replanting stage. This fall will see over 400 acres of rangelands being repaired. This project was coordinated with DWR’s farm bill biologist, Steve Wilcox. It took a little over three years to put together. The previous projects involved many government specialists, including wildlife biologists, water engineers, fire wardens and conservation planners. The family has had to endure dozens of planning meetings, which for outdoor people is very painful! The DWR and our local sportsmen would like to thank the family for its dedication and hard work to improve our local wildlife habitat. Only 10,000 acres to go!